In 1906, a bid to build over the gardens of Edwardes Square in Kensington led to the London Squares and Enclosures (Preservation) Act, introduced by the London County Council, which protected 64 squares. The MPGA continued its work in saving squares for the public, such as West Square in Southwark, and St Peter's Square in Hammersmith. In 1916, the Association persuaded a number of private squares to open up to convalescent wounded soldiers, and then to all soldiers on leave. By 1928, the MPGA had rescued more than 30 squares at a cost of £12,000. Nevertheless, squares continued to be vulnerable. In the 1920s, the gardens of Mornington Crescent were sold to cigarette manufacturers Carreras, which built a five-storey factory there, while two of a quartet of squares at Endsleigh Gardens, in Euston, disappeared beneath Friends House. The public outcry over the loss of these gardens led to a Royal Commission in 1927, which resulted in the London Squares Preservation Act of 1931. The Act gave protection to 461 squares and other green enclosures, ensuring that they could not be built upon and were preserved for leisure and recreation. About one fifth of the enclosures protected by the Act were by this time in public hands. However, the Act did not prevent alterations in the buildings surrounding squares over the rest of the century. In Bloomsbury, much of the original Bedford Estate housing disappeared in the 1930s beneath university blocks and modern hotels. Many houses were converted into offices, dramatically altering the appearance of Soho Square and others. 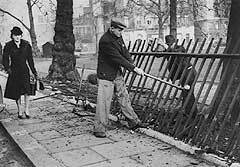 During WW2, the railings of many squares were taken to be melted down and used for armaments. Their loss had a huge effect on the appearance of squares, and sadly for no reason, as most of the railings were thrown away unused. However, the removal of railings created greater access to squares, and after the war many remained open to the public. Some, like St James's Square, continued to be privately owned, although accessible by the public, while others were leased or given to local authorities by landowners who could no longer afford their upkeep. London squares 'did their bit' for the war effort. Grosvenor Square became known as 'little America', home to General Eisenhower's HQ from 1942. Air raid shelters were built in some, like Soho and Manchester Squares. Many, like St James's Square, were dug up and given over to vegetable growing as part of the 'Dig for Victory' campaign. Belgrave Square became a tank park, while Hereford Square was used as a baseball pitch by American GIs. Some, like Cleveland Square, became sites for barrage balloon moorings or fire brigade water tanks. In 1914 the 11th Duke of Bedford sold Covent Garden for £2million and invested the whole sum in Tsarist bonds. "…the [squares] add greatly to the amenities…of London as a whole…Their loss…would effect an alteration in the characteristic development…of London…which would in our view be deplorable."